Mardi Gras is shrouded in secrets. 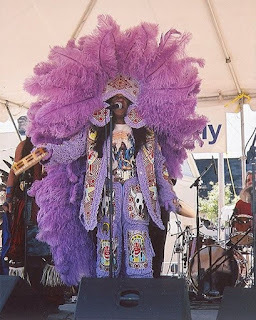 Masked revelers, mysterious gatherings, and elaborate costumes are a huge part of the magic that makes the occasion special, and the Mardi Gras Indians embody that combination of secrecy, mystery, and time-honored tradition perfectly. Who are the Mardi Gras Indians? What unique role do they play in New Orleans Mardi Gras tradition? How did they originally come to be, and what are they all about? Here, we’ll take a closer look at the answers to all of these questions and more. The Mardi Gras Indians are a group of African-American Carnival revelers active in New Orleans, Louisiana. They are called Indians because their elaborate handmade costumes are heavily influenced by traditional Native American ceremonial attire. 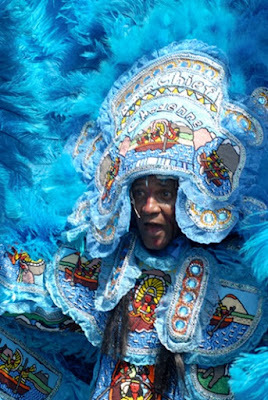 To this day, the Indians are considered to be one of New Orleans’ most colorful and fascinating Mardi Gras groups. They are also one of the most mysterious. Although the Indians do tend to gather and celebrate in the same places each year, the times, dates, and routes of their parades are rarely to never published in advance. Despite the fact that they’ve been parading for more than 100 years, their annual parade may be the least widely recognized of all the Mardi Gras traditions. However, an Indian performance is nevertheless considered a cultural staple that is absolutely not to be missed. Most traditional Mardi Gras parades, balls, and other celebrations are sponsored by established groups of revelers called krewes. Traditionally speaking, krewes name their parades after various Roman or Greek gods. Their membership structure also nods toward a royalty theme, as various members may rank as knights, captains, kings, queens, dukes, and so forth. Most of the more established krewes also extend membership by express invitation only. Naturally, the average person that resided in poor African American neighborhood had a lot of trouble becoming part of the early krewes in the early days of Mardi Gras. However, they weren’t about to let that stop them from being part of the festivities. They decided to develop their own approach to the celebration and founded the Mardi Gras Indians. Mardi Gras Indian krewes are named for imaginary tribes of Indians. Each corresponds to a different street attached to a ward or gang. They call themselves the Indians as a way to pay respect to the way Native Americans helped black people escape the horrors of slavery. At that time, Native American communities and societies readily accepted slaves as part of their society, and the black community of New Orleans has never lost sight of this connection in history. Today, the Indians are known for taking every opportunity to shine by showcasing their glorious costumes, gift for music, and one-of-a-kind contagious spirit. However, in the past, Mardi Gras was more a day of violence and mischief for the Indians than anything else. The confusion, hectic energy, crowds, and sheer number of events associated with Mardi Gras made it difficult for police to intervene, so early Indians often took the opportunity to settle scores on the streets. For that reason, many families were afraid of the Indians and made it a point to steer clear of their parades and gatherings. It was also among a mother’s worst nightmares to hear that her child was thinking of joining the Indians at some point. Members of various tribes were often violent even with one another. These days, despite the violent roots of early Indian parades, modern Big Chiefs prefer to keep things competitive but friendly. When two Mardi Gras Indian tribes happen to pass one another, they make it a point to compare the craftsmanship and artistry of one another’s costumes. They may also break into a song, chant, or ceremonial dance as part of a friendly challenge. Eventually, each Big Chief will stand back and acknowledge the awesomeness of the other’s look and performance just before the procession moves on. 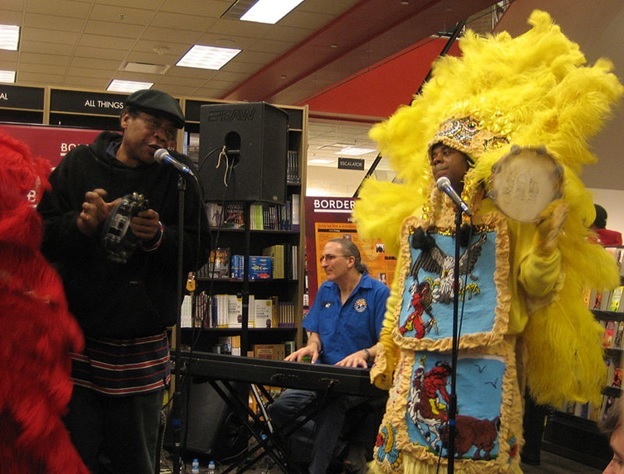 Where Can You Spot the Mardi Gras Indians? Naturally, the easiest and the best day to catch a glimpse of the Indians is Mardi Gras. As can be expected, the group positively comes to life in the spirit of Mardi Gras and, despite their lack of announcement in regards to their gatherings, it’s generally not too difficult to run into them if you put your mind to it. Last, but not least, it often pays off to simply ask a local known to be knowledgeable in regards to the Indians. Alternatively, it sometimes also pays to check the local newspapers for last-minute announcements of impromptu events. It’s a given that New Orleans, in general, pulls out all the stops when it comes to Mardi Gras. However, no one takes the art of costuming and attire more seriously than the Indians. To see the Indians in action is to feast your eyes on positively unforgettable hand-sewn creations that feature incredible imagery, beautiful beadwork, sparkling sequins, and truly majestic colored ostrich plumes. Their call-and-response approach to music is also well worth experiencing in person. Members of a handful of the tribes – like the Wild Tchoupitoulas and the Wild Magnolias – have even released critically acclaimed recordings and perform professionally. Their unique sound has even made its way into New Orleans soul, funk, and R&B at large. (Notable examples include songs like “Iko Iko” and “Hey Pocky Way.”) Make them part of your Mardi Gras festivities this year!